For years baseboard heating was the home heating system of choice for many consumers. Relatively cheap and easy to install, baseboard heating systems were installed in new homes in the 70s, and without knowing their other options, many consumers have stuck with it—until now. Radiant floor heating is quickly trumping baseboard heating as the titan of the home heating market. With its superior heating capabilities and maintenance-free logistics, radiant heating is persuading consumers everywhere to make the switch from baseboard heating to radiant heating. By taking a look at how the two different systems work and their pros and cons, you'll quickly see that saying goodbye to baseboard heating is the best decision you'll ever make as a homeowner. Efficiency: Baseboard heaters aren't exactly known for their efficiency. Heating a whole room with a baseboard heater can take quite a while, so you have to plan ahead if you want the room to be warm when you're home. Because they take so long to heat up, baseboard heaters can quickly rack up your electricity bill. Installation: Baseboard heaters are relatively easy to install, but you have to waste a large amount of wall space to do it. What's more, baseboard heaters are quite unsightly and noisy, and they must be strategically placed as to not conflict with furniture placement. While radiant heated floors require a little more elbow grease to install, it's not difficult. Any motivated do-it-yourselfer can install heated floors. Additionally, radiant heated floors require no wall space, and you don't have to worry about an unsightly heater sticking out of your wall. After all, what's a warm room if it's an ugly room? 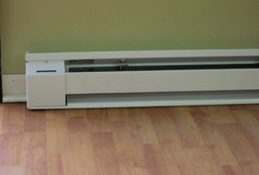 Maintenance: Baseboard heaters use heat coils that need to be frequently vacuumed. Dust on the coils reduces the effectiveness and efficiency of the heater, taxing your heating bill and reducing the lifespan of the system in general. What's more, a dirty heater makes your house smell like burnt dust - not the most pleasant smell in the morning. Electric radiant heated floors require absolutely no maintenance. It's as simple as that. There are no moving parts or coils to clean, and with the high-quality heat cable and thermostat, you can count on your floors to provide warmth for years to come. Continued - Read Radiant Heat vs. Baseboard Heating (Part II).